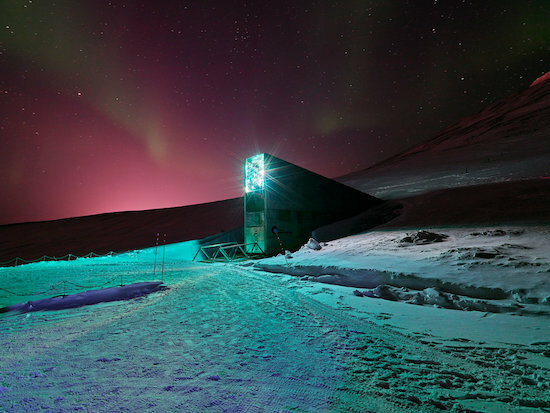 The Svalbard Global Seed Vault is an underground repository located at 78 degrees North latitude that currently stores nearly a million seed samples to preserve crop diversity for the future. 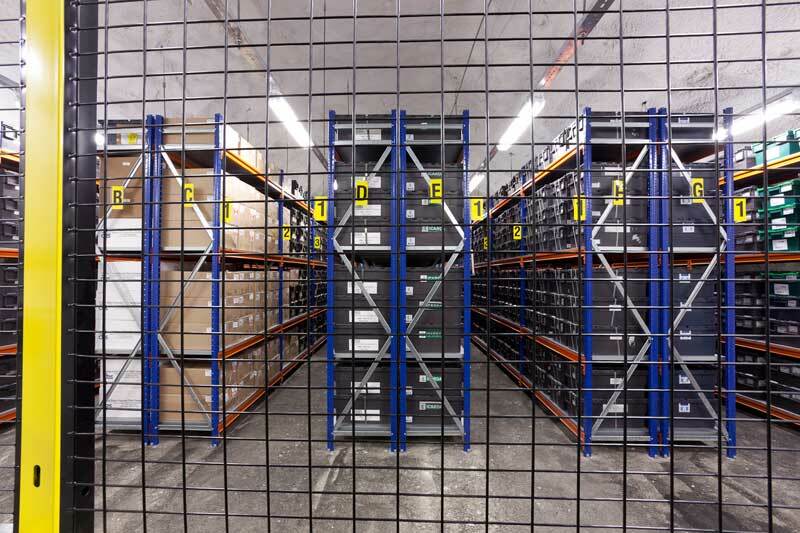 Many see the vault as a resource for a “doomsday” scenario brought on by severe climate change or other ecological disaster. Long Now has been following the Svalbard vault closely since it was first announced over a decade ago. 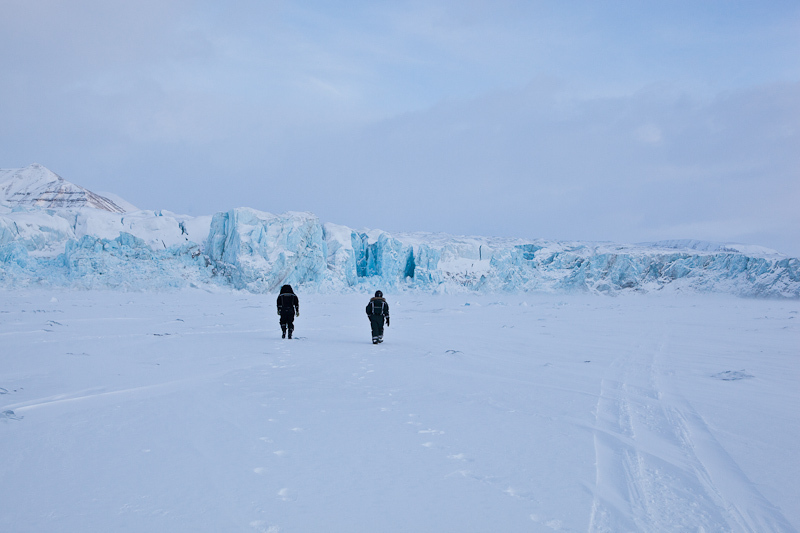 In 02011, Long Now Executive Director Alexander Rose had the opportunity to visit Svalbard with unprecedented access to the vault through a partnership with the Center for Land Use Interpretation (CLUI). Rose’s account of the trip follows below, and includes an update on the recent surge in public interest surrounding Svalbard over the past year. Over the last couple years artist Steve Rowell has been planning a project to document the Svalbard Global Seed Vault as part of a larger project about the beginnings and future of agriculture. 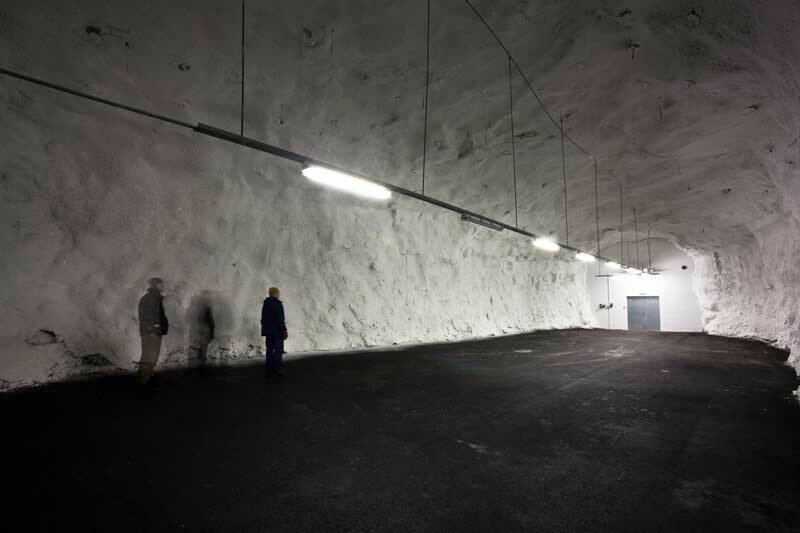 The Seed Vault is designed with a 1000 year design life to store back-up samples of every food crop seed in the world. About a year ago Rowell contacted me to see if Long Now would be interested in participating in his project. I said that we would as long as I got to come along on one of the trips to Svalbard and meet the creators of the Vault. The Norwegian government management of the vault required that Rowell also get participation from Scandinavian nations, specifically Norway as part of his project. Over the last year he was able to secure funding and collaboration with a Norwegian and a Dutch artist, and with it an official invite to visit the Vault. Long Now would cover our accommodations for this scouting trip, and I would cover my own flight. 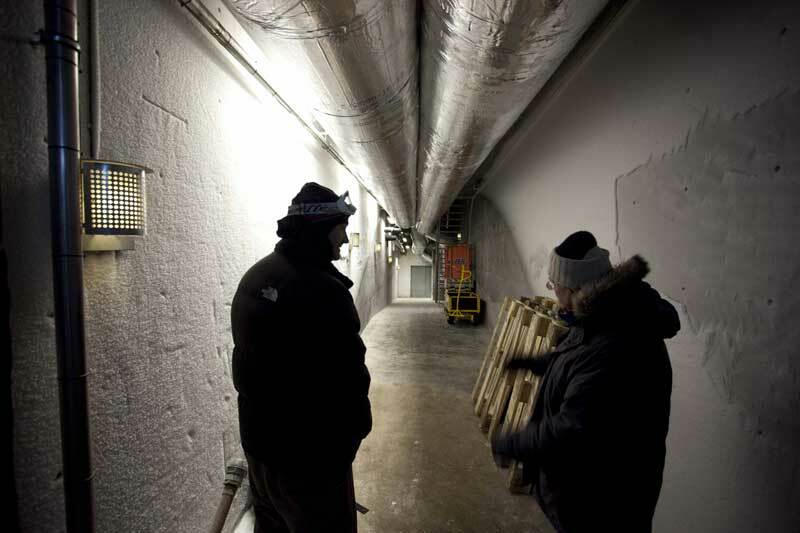 The Seed Vault administrators seem to be a bit overwhelmed with the interest in the Vault. They open the Vault about twice a year to deposit new seed stock and they are apparently inundated with requests to visit. However the remoteness of the location and their limited time on site means they really don’t have time to give many tours. But with persistence and the Scandinavian participation Steve was able to secure us the invite. We quickly booked our complicated flights, and found accommodation in one of the few places to stay in winter. On February 22nd I boarded a Lufthansa jet bound for Munich out of San Francisco. I would be meeting Steve in Oslo the following evening as he was traveling from Washington DC. It took three tries to fly out of Munich due to aircraft difficulties that resulted in me arriving at 1:30 am in Oslo. After a couple hours of sleep I met Steve the next morning at the airport hotel breakfast area, and we boarded our SAS flight to Tromsø at the northern tip of Norway. It was a rare clear day, and I was able to see the stunning fjords of Norway as we crossed the 66th Latitude into the Arctic circle. In Tromsø we were asked to exit the plane and go through an ID check. I think it has something to do with the unique treaty status of the Spitsbergen Archipelago where Svalbard is. The Spitsbergen Treaty, ratified almost a century ago, gives Norway sovereignty over the area, but they have to grant completely equal access, immigration, and commercialization to any signing nation with minimal taxation. This also means that there are a number of refugees on the island, and I suspect they want to keep track of them. 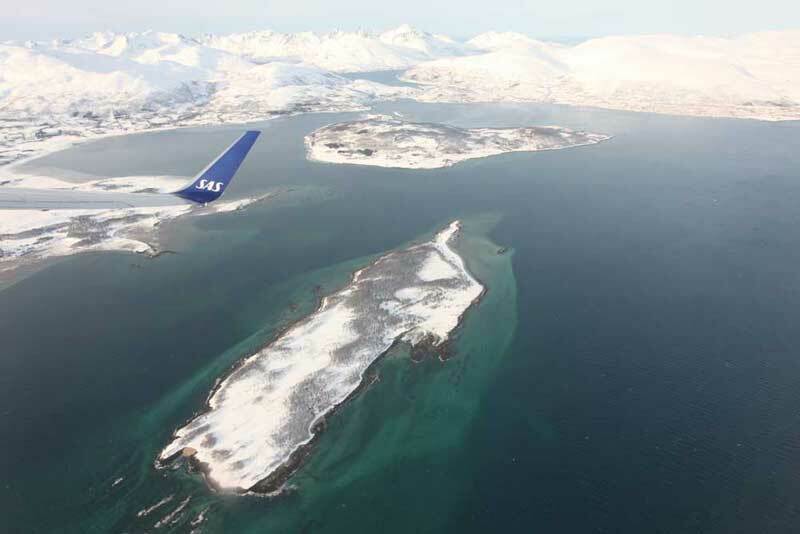 We re-boarded in Tromsø to find the plane completely packed. Aside from its major coal mining activity and arctic scientific research, Svalbard is a winter tourist destination to see the northern lights and wildlife. Crammed onto the plane were Swedish grandmothers, Russian coal miners, scientists and even a couple babies. Everyone had shed the usually fashionable northern European winter-wear for serious expedition wear. Huge gore-tex parkas with fur lined hoods and patches reading “Antarctic Survey 1996” abounded. We landed in 30 mph crosswinds and driving snow. The pilot was clearly used to the airport bringing the plane down fast, but touching down without even a bump. We caught the local bus to our accommodation – Mary-Ann’s Polarrigg, and even glimpsed the Seed Vault perched just above the airport. The town of Longyear was founded by an American from Massachusetts of the same name. He bought the rights to a coal deposit from a Norwegian company and established one of the first permanent outposts on the island. With the coming of the airport in the 70’s, Longyearbyen changed from a tiny mining town to a University town and adventure tourism destination. 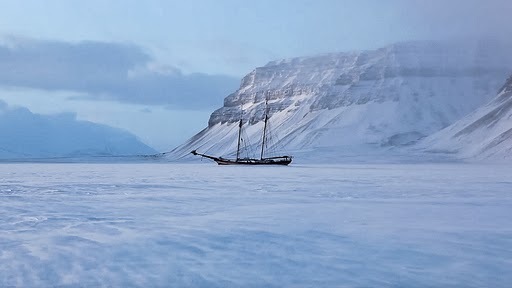 I will not recount the history of Svalbard in any detail, it is well recorded by many sources including Wikipedia. I do recommend The Future History of the Arctic by Emmerson for anyone interested in the bizarre and increasingly consequential future, present and past of the Arctic region. Mary-Ann’s Polarrigg (entry shown above) known locally as “The Rigg” is a long row of prefab buildings from various eras, mostly leftover from the mining industry. Mary-Ann the proprietor is an amazingly sweet lady who has filled the place with the wildest and weirdest eclectica to be found on Svalbard. Stuffed polar bears and arctic foxes mingle with old mining equipment and incredible historic photos. She is also the chef, preparing hearty Nordic breakfasts and dinners of local seal, trout, reindeer and of course… whale. (In Norway they have t-shirts with a picture of a whale and the tag line “Smart food for smart people”. Our first two bone-chilling days on the island we spent touring around in a borrowed car from Mary-Ann as our appointment at the Vault was not until our third day. There are only a few miles of road there, the longest runs of which service the airport and the coal mines. We got a tour of the Polar University where every student is taught arctic survival and how to use a rifle. Everyone on Svalbard is required to own a gun, and be trained in its use, for protection from polar bears. Svalbard is the first place I have ever seen 20 year old students walking in and out of school with rifles slung over their shoulders. There is a strange basic irony about Svalbard that we discovered on the University tour. One of the main research topics and political focuses on the island is climate change and atmospheric pollutants. While the Norwegian mainland gets all its electricity from clean hydro-electric power, the only coal fired power plant in Norway is actually on Svalbard. But without this coal power, the island would have to evacuate in less than 48 hours. On Svalbard coal equals life. Sunday was the scheduled day to visit the Vault, and that morning it was a white out blizzard. 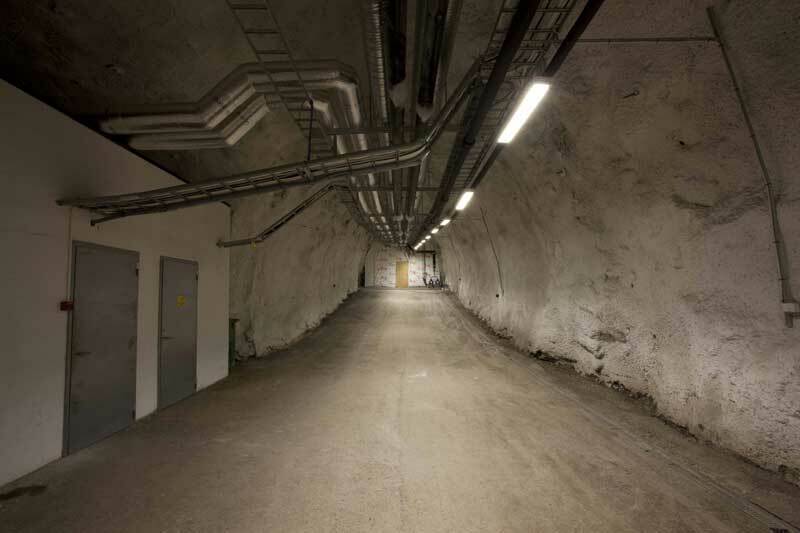 We had been told that not even the Royalty of Norway were allowed in the actual seed vault, and to expect to only see the entry hallway. Our guide at the University, a few days before, was shocked that we would even be allowed to see the hallway. The drive up the switchbacks was a bit perilous in the snowstorm. We had to stop multiple times as visibility dropped to zero. We met our hosts Roland von Bothmar and Anders Nilsson of NordGen at the top of the road, and together approached the vault. Apparently they had spent a lot of time the previous day cracking and melting ice off the door as it had been above freezing allowing water to run down, and then freezing the door shut as the evening temperatures dropped. (Note that there is a lot value to a design that sheds water away from hinges, seems, and especially locks.) Their work had paid off though as they were able to open the door quickly and we all scrambled in out of the nearly horizontal snow stinging our faces. The 320 feet of fluorescent lit down sloping entry hallway is separated into three equal sections. This first section we enter into from the outside door is not completely sealed off from the outside air. 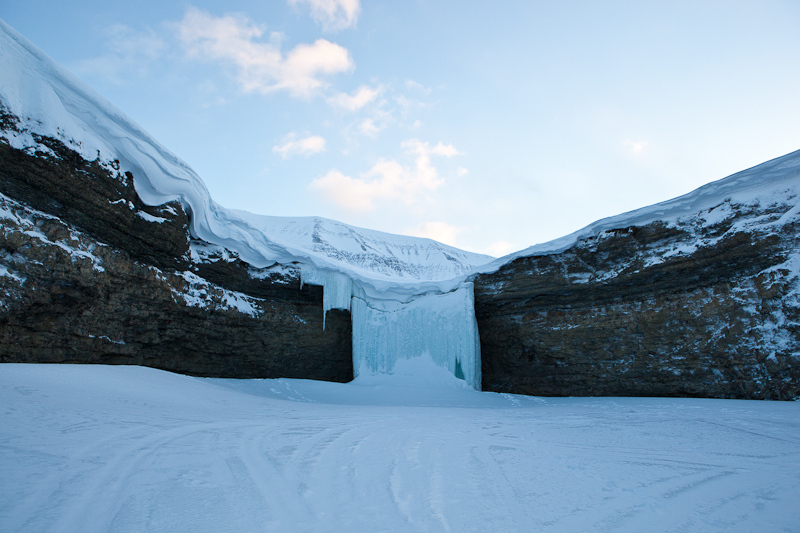 You can see where the permafrost meets the building in a sloping line of hoarfrost built up on the wall. We move deeper toward the next door. Roland asks us to watch out for the ice on the floor, apparently the freeze thaw cycle melts the frost on the walls which then runs down the floor and then freezes again, making the ramp treacherous. On the other side of the door the hallway widens to a 20 foot diameter corrugated metal tube with a concrete floor. Roland explains that this part of the vault has been shifting as the permafrost around us thaws and freezes. Indeed the concrete on one side of the floor is cracking as evidence of this. The wall at the end of this section is a new addition and is still covered in a tyvek like building wrap. Through the doors the asphalt starts sloping back upward and we enter into a lateral access hall where you can see each of the three seed vault doors. The doors are embedded in concrete walls blocking off each rough blasted chamber. 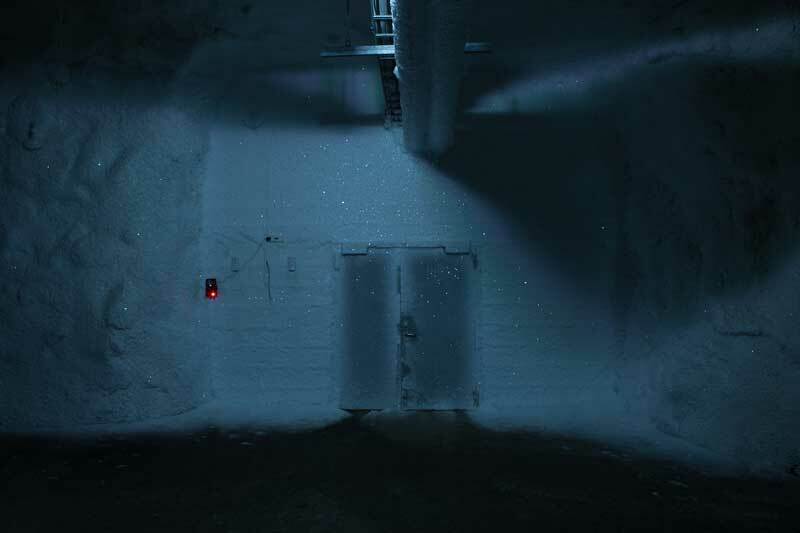 The central chamber, vault 2, is covered in a thick layer of frost, cracked away around the door from the recent depositing of this years seed stock. The cooling pipes above are fully covered in thick frost here as well. The only adornment in the whole space is a spear-like metal shape on the wall, a seed sculpture by a Japanese artist who donates these pieces to seed banks all over the world. There is a shelf here with some plastic bins and seed samples of the types found in the vault. Glass jars, vials and bags each containing labeled seeds from different seed banks around the world. Now they use a standardized mylar zip lock bag and plastic bin. However Roland points out the USDA submissions always use their own box, a cardboard one. 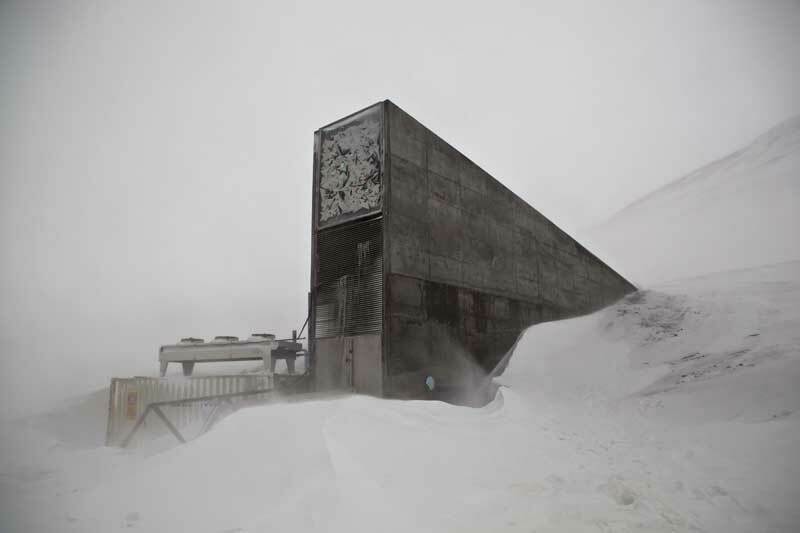 It turns out that this seed vault is the second one on Svalbard. There was one created in the 01980s for just Scandinavian species which is inside a shipping container in one of the old coal mines. It was sealed 30 years ago and Roland hasn’t even been there. 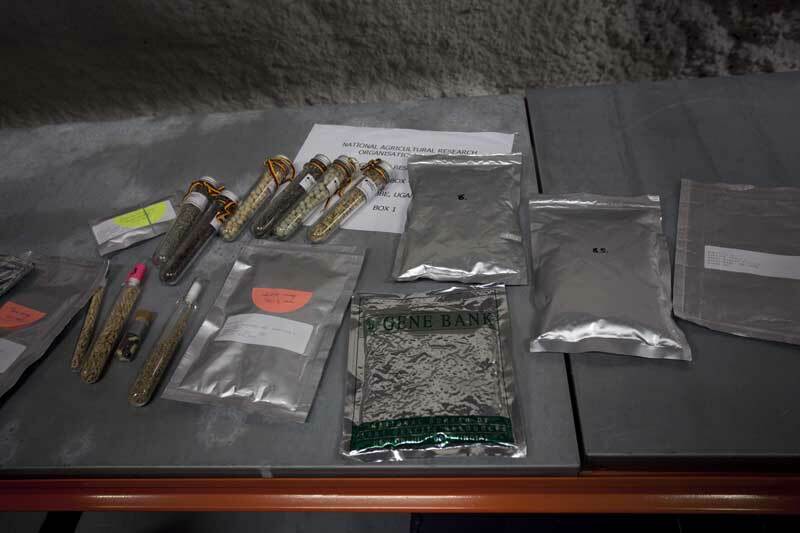 Roland explains that all the seeds arrive by cargo plane a week ahead of each deposit, upon arrival they use the airport x-ray machine to make sure there are only seeds being deposited (e.g. no bombs). In the last 3 years since the vault opened they now have over 637,000 varieties in the vault, and they have not even filled up one chamber yet. Roland also confirms what we learned from the University, that all the seeds here are edible crop seeds with one exception. Through a partnership with the University at Svalbard they have stored about 60 varieties of plants from the Spitsbergen Archipelago, none of which are edible. Roland opens one of the empty vaults for us. We shuffle into the air lock area and after the outer door is closed, the next door is opened. This vault, number three, has no seeds or cooling system. It is about 100 feet deep and 30 feet wide and tall. Some of the same shelving used in the active vault is in here, along with the plastic bins ready for more seeds to be delivered. Amazingly the thick stone wall shared with the active vault two is covered in frost. Wires dangle from sensor equipment on each wall, and there is one spot you can see the fractured native shist where the shot-crete doesn’t quite meet the floor. We also go into the other empty vault, number one, and it is similar, except it is completely empty. We ask if the spaces were sterilized or treated in any way before the seeds go in. Roland says that they are not, and that the mylar bags and the cold are all the seeds need. Then to our surprise, Roland offers to open the active vault. Jimmy Carter wasn’t even allowed into that vault. We crowd close to the ice covered door, we need to let as little cold air out as possible. Roland unlocks the door with one of only four keys in the world, and we hear the frost crack at the hinges. We rush into the airlock, and the next door is opened. This vault is COLD. The difference between -5c and -18c (0F) is palpable. The inside of my nostrils hurts and the skin on my face tightens. Most of the space near the door is taken up by the cooling equipment. Apparently this equipment was installed just 6 months ago to replace the original equipment that was less efficient, loud and blustery. Ten feet in front of us is a locked gate, and ten feet beyond that are the shelves and shelves of boxes. Each box is marked with the logo of a seed bank from a different nation, the USDA cardboard boxes are front and center in the second row of shelves. We are allowed a few photos and video and are ushered quickly back out again. After the visit I read some of the material we received. It doesn’t go too much into the “why” of things, just what happened in the building process. But what was apparent was that they had a very tight deadline, and I am not sure why. Most of the decisions, location, contractors, and material choices were made solely for this expediency. While it will likely be okay if people are there to maintain it, it seems some of the issues like the shist rock site, ferrous metal reinforced concrete, permafrost shifting and flooding, may require a lot of intervention to maintain the integrity of the vault. I certainly learned a lot being here. Mainly that even if you put your site in the hardest to reach place in the world, people will still want to come and visit it – in droves. They did not design it for visiting, and are having to deal with this fact now. We ended the day with a dinner up at Huset, the most northerly restaurant with a Michelin star. We ate scallops and reindeer with Roland and Anders as well as a seed scientist from University of Arizona who was in town to deposit their collection of desert legume seeds from around the world. What an amazing day. Our last day here we finally got an opening in the weather. We arranged a guided “skooter” (snowmobile) tour and our original plan was to visit the Russian coal outpost of Barentsburg, but after talking to some folks we switched it over to Temple Fjord. 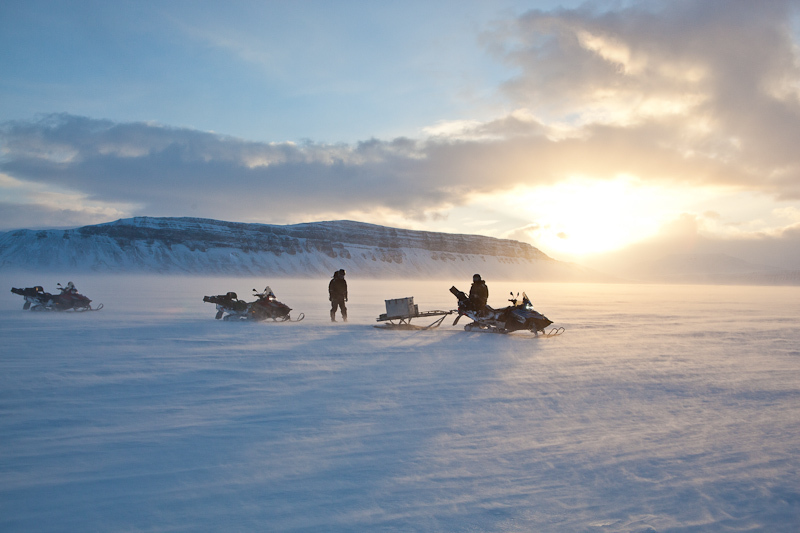 I cannot recommend touring Svalbard this way enough. We even saw the direct sun for the first time since our arrival when out on the fjord. Be prepared for cold unlike anything you have ever experienced. Under the thick “skooter suit,” boots and helmet loaned to me by the guide I wore: expedition weight base layers, a complete down suit, a fleece, two pairs of thick socks, a neck gator and a balaclava. I still got chilled to the point of numbness. Any small chink in your armor, and the wind augmented by 50km/hr on the scooter cuts right to your bones. We encountered a dutch two masted sail boat that purposefully traps itself in the sea ice each year there. They operate it as a kind of outback adventure hotel. Do not miss touring these outer areas, they are spectacular. Some notes about clothing. The Norwegian tradition of removing your “outside shoes” is honored almost everywhere on Svalbard. Bring snow boots that are easily removable, and carry some slippers or flip flops around with you so you don’t end up in your socks everywhere. The other pro-tip is to bring a pair of ski goggles with clear lenses (not dark tinted as you wont be able to see). Even if you are walking 500 yards, you will be glad you did in a snow storm. As you might expect bring lots of down, fleece and gore-tex layers. Neck gators, balaclavas, mittens and glove liners are also a must. It can rain, snow, blow 40 mph, and then turn to sunshine all within an hour. Headlamp and even a little red flashing jogging light is also a great idea for walking around after dark (eg. after 3pm). 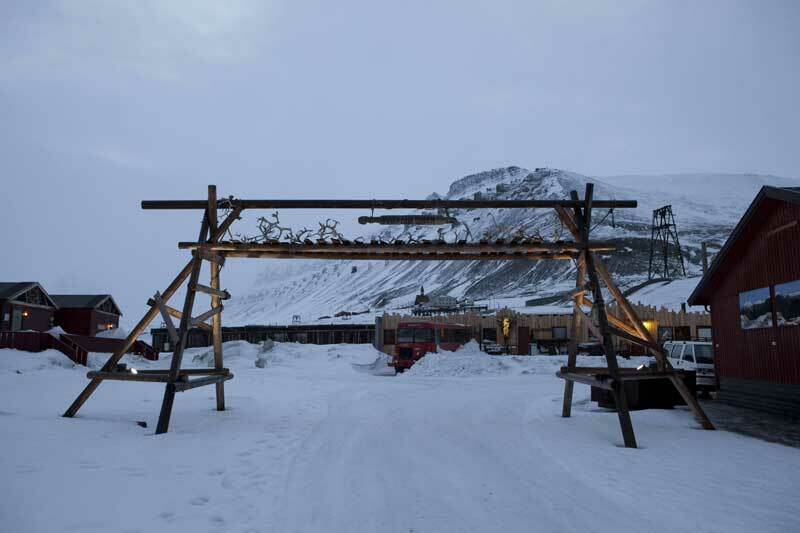 There are some excellent eating and drinking establishments on Svalbard. The Michelin starred Huset up high in the valley is astonishingly good, (but pricey) and includes a wine list of over 1100 titles. Also the pub in town next to the market has one of the largest single malt whiskey collections in all of Europe, not to be missed. You should also stop by the Svalbard Museum, it has won several well earned exhibit design awards. Likely one of the most interesting and informative small museums I have ever been to. A general note that if coming in winter (which I do recommend) that you put at least a day or two of float in your schedule. While you can do most things even in the worst weather here, it seems a bit silly to tour the fjords when you have 20 feet of visibility. Also note that there are 4 months of the year where there it basically as dark as night. We had plenty of indirect light on our trip at the end of February. 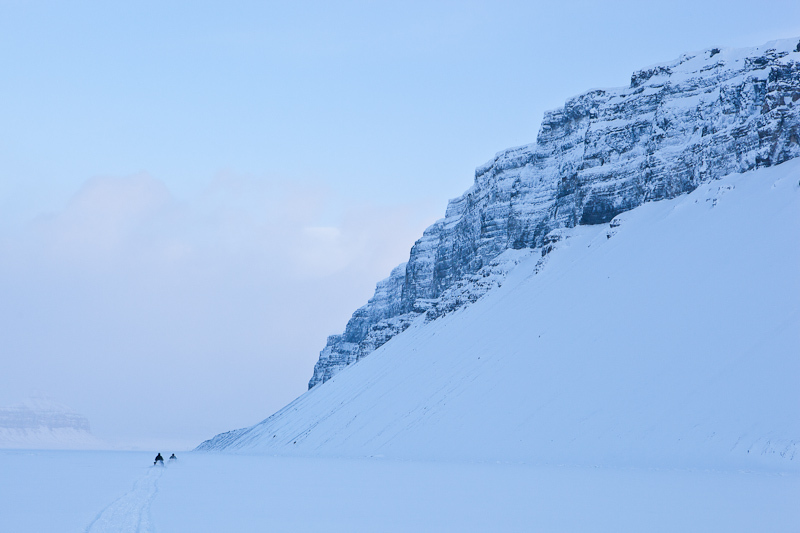 Living and travel costs in Scandinavia are expensive, but Svalbard is even more so. Pretty much everything aside from water, reindeer, and polar bears has to be imported by air to Svalbard. A personal pizza and drink can easily run $20-30, a simple dinner for two and a couple beers can come in well over a $100. Simple accommodations even in the slow season are hard to book and expect to pay over $150-300/night. The Polarrigg was nice as they have a full kitchen for guest use, and Mary-Anne let us use her vehicle several times at no charge. There is a Radisson which is very central, a huge benefit as its a very short walk to most local services (you can walk from the Rig as well but it’s about 1/4 mile in often bad weather). The funny thing though is some things cost less than on the mainland because of the unique tax status of Svalbard. Alcohol is much cheaper here, basically US prices. Public interest in Svalbard has surged recent months. An incident from October 02016, in which the entrance to the “fail-safe” vault was breached by water brought on by unseasonably warm weather, passed with little notice at the time, but went viral in May 02017 as it became apparent that the United States would pull out of the Paris climate agreement. “Suddenly the tidings from Svalbard were everywhere, in multiple languages, with headlines like ‘World’s ‘Doomsday’ Seed Vault Has Been Breached by Climate Change,’” wrote Mallia Wollen of The New York Times in a photo essay published last month profiling Svalbard and other “doomsday vaults”that are “racing to preserve a natural order that is fast disappearing” in the epoch of the Anthropocene. It didn’t matter that the flood happened seven months earlier, or that the seeds remained safe and dry. We had just lived through the third consecutive year of the highest global temperatures on record and the lowest levels of Arctic ice; vast swaths of permafrost were melting; scientists had recently announced that some 60 percent of primate species were threatened with extinction. All these facts felt like signposts to an increasingly hopeless future for the planet. And now, here was a minifable suggesting that our attempts to preserve even mere traces of the bounty around us might fall apart, too. Outlets such as the Washington Post followed with articles that attempted to calm the hysteria, with headlines like “Don’t Panic: Humanity’s ‘Doomsday’ Seed Vault is Probably Still Safe.” As Alexander Rose notes in his trip report above, scientists have known about the water-and-freeze thaw issues at Svalbard since it opened in 02008. 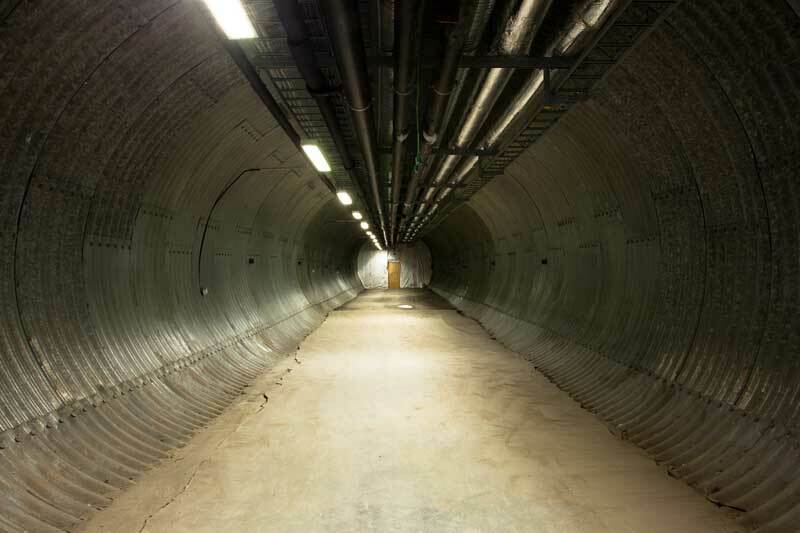 Cary Fowler, one of the creators of the vault, told Popular Science that “the tunnel was never meant to be watertight at the front, because we didn’t think we would need that. What happens is, in the summer the permafrost melts, and some water comes in, and when it comes in, it freezes. It doesn’t typically go very far.” Fowler followed with an interview on NPR’s Fresh Air last month. While he didn’t discuss the breach, he explored many of the “conspiracy theories” and public misperceptions surrounding the vault. For a more recent look inside Svalbard, see The New York Times’ 360 degree video and virtual reality experience published in May 02017. Cary Fowler’s book, Seeds On Ice, was published in September 02016.